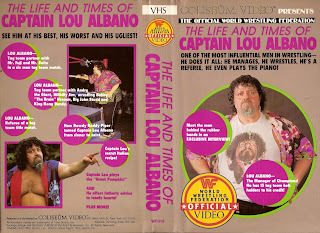 My childhood memory of Captain Lou isn't so much for his fabled professional wrestling career or appearance in Cyndi Lauper's Girls Just Wanna Have Fun music video, but for his stint as the live action Mario and the trademark character's voice on The Super Mario Bros. Super Show! cartoon in the early '90s. Though judging by what I've seen after the fact and from my father's warm recollections of his time in the WWF (screw those pandas); Lou certainly was an enduring genuine article in an era of pro wrasslin' that nurtured fun authenticity instead of T&A and convoluted As the World Turns storylines. So like the way he'd autograph memorabilia always stated, Jesus bless you, Captain Lou Albano. R.I.P.